The Federal Income Tax was established in 1913 by the 16th Amendment to the Constitution, but it was not until 1930 that the Supreme Court first legalized the combining of two incomes on a single tax return (in states with community property laws) and not until 1948 that Congress passed legislation making Married Filing Jointly legal for all states. Following that, it became a standard annual practice for most middle class families in the 60’s, 70’s, and 80’s to check the Married, Filing Jointly box on the family income tax return and enjoy the resulting lower tax bills. It was a good system for traditional families, one parent working outside the home for income, one parent focused on child rearing and homemaking, and a few kids enjoying their childhood freedoms. But it was, and continues to be, an unfair system, taxing single persons more in order to tax married persons less, forcing singles to help support the families, or leisure activities, of the married. 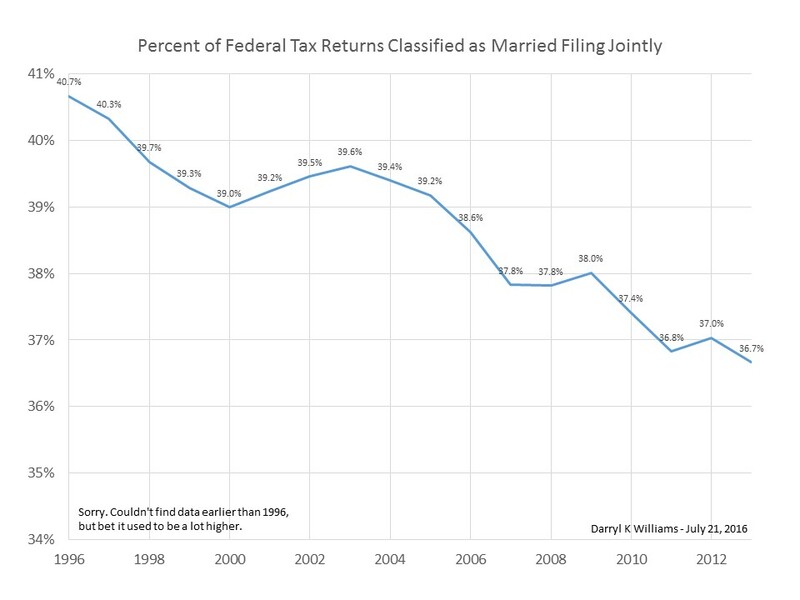 As the culture changed, we, us, and our shoved aside in favor of I, me, and my, marriage delayed and divorce more common, prosperous two-income families with housekeepers and nannies and poor single parent families on the rise, justification, if not support, for the special tax treatment of traditional married couples faded. Hopefully we will soon have a much simpler tax code without deductions, exclusions, exemptions, credits, and different rates for different people. Of course all culture changes are not good. We are poorer because of our independence, low income households being hurt the most. 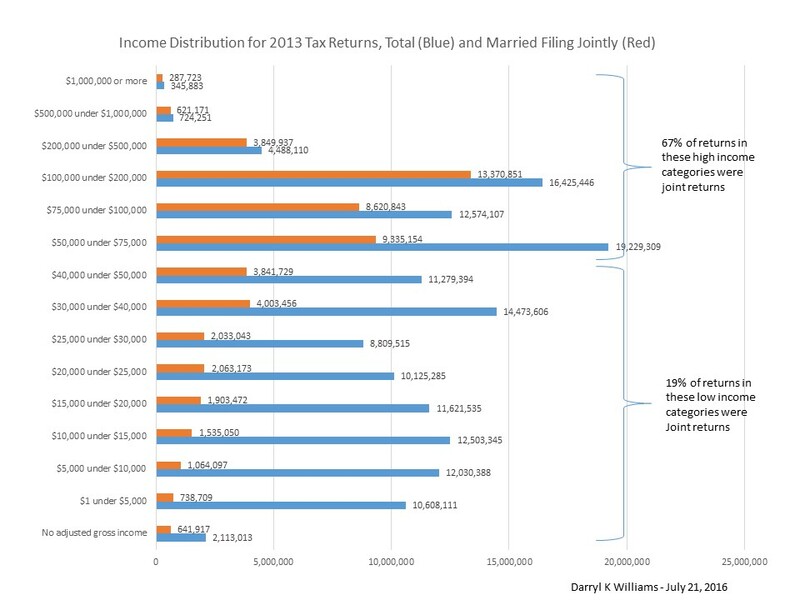 I’m not going to get into cause and effect, but it is a fact that higher incomes tend to be associated with married couples filing joint returns and lower incomes tend to be associated with individual returns. And the downward trend in joint returns continues. So, get a good education, get a good job, and then get married and support each other. It works pretty well and makes financial success easier for most. After all, the traditional family unit, mother, father, and children, has been the most basic organizational unit of society for centuries.